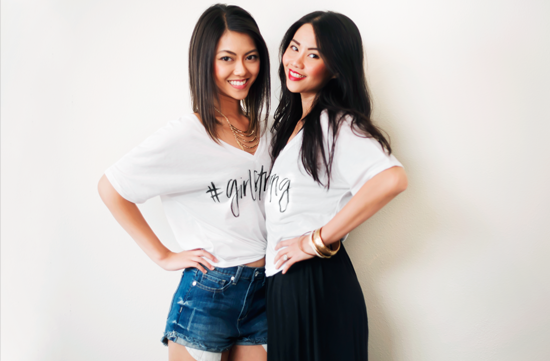 I'm honored to be invited by Shabby Apple to participate in their #girlstrong campaign. The purpose of #girlstrong is to empower women, and together, bring awareness to help fight against a global issue that is affecting lives of millions across the world — human trafficking of girls and women. As part of the campaign I was given two #girlstrong t-shirts, one for myself, and one to give to a woman who inspires me. My #girlstrong inspiration goes to my mother. Ever since I could remember, she frequently said this simple, little phrase whenever I found myself in a rut, “Be honest with yourself." As a child, I was able to vaguely grasp the meaning behind those simple words, but not until recently did I fully understand them. Life is a work in progress -- I am learning and growing every day, and in order for me to flourish, it primarily comes down to one thing: being honest with myself. It's tough to be brutally honest with myself because sometimes the truth isn't always what I want to see. My mother has always taught me to love and embrace who I am, but to also admit my faults and weaknesses. In doing so, I'm able to see with clarity the path it takes to become a better person. Through her honesty, patience, grace, and unconditional love, she has helped me strengthen my weaknesses, and change the things that I needed to change about myself. My mom is the epitome of the type of woman I want to be one day. She loves passionately, speaks through her actions, lives sincerely and fights for what she believes in. Thank you, mom, for always shining your light so bright that in the darkest days, I was able to find my way. I love you. You inspire me to become a better person every day. For every #girlstrong used on Instagram, @shabbyapple will donate 10 cents to the Elizabeth Smart Foundation, a charity that helps fight the trafficking of girls and women. Let’s be a source of empowerment for each other, and together, fight for the human rights and equality of all girls and women around the world. I ask each and every one of you to join me in supporting and fundraise for this cause by tagging women in your life that has inspired you. Be sure to add the hashtag #girlstrong.